Travel, for me, is the perfect excuse to spend time together, whether it is a country walk in Devon, a mini-break in Paris or a relaxing beach break in Mauritius. It is nice to get away from the hustle and bustle of daily life and switch off. I love that some places just have something about them that make them really romantic like Paris, Bali, and Santorini. Here are my picks of my top 10 most romantic getaways, perfect for honeymoons, anniversaries, birthdays or just some much deserved quality time together. Mark Twain quoted an islander as saying: “Mauritius was made first and then heaven; and heaven was copied after Mauritius.” He is absolutely right. 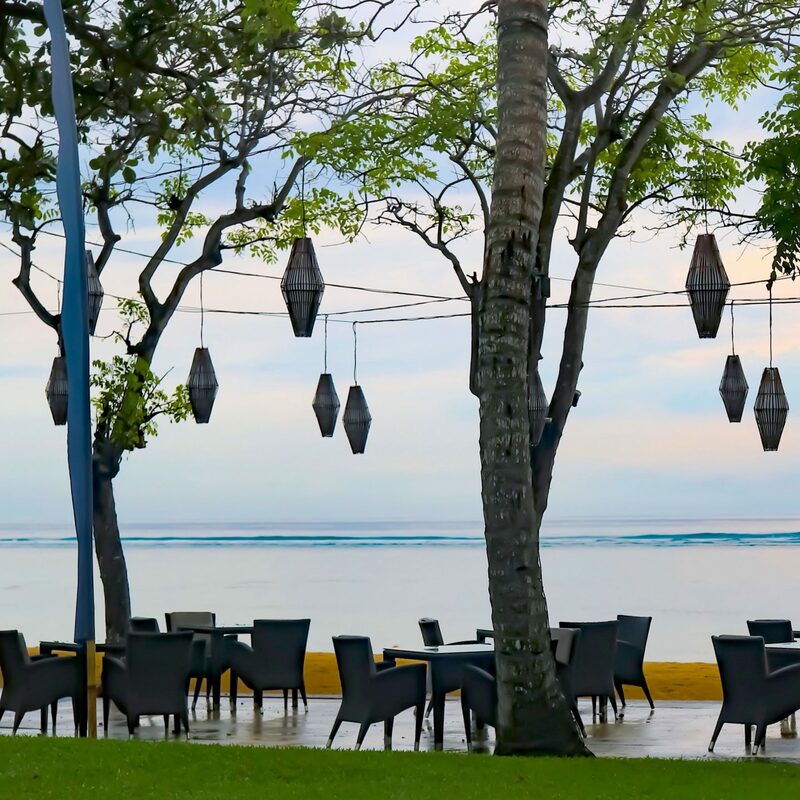 Mauritius with its palm-fringed beaches backed by clear waters, idyllic resorts, dramatic scenery and amazing hospitality makes it one of the most romantic gems in the Indian Ocean. The sunsets are spectacular, the beaches postcard perfect, and the food divine! For the geology geek in me, Santorini’s awe-inspiring landscape dominated by the Caldera is a photographers dream and a romantic island with mesmerising views. I fell in love with this picturesque island with its blue and white palette and it is the perfect Greek island for a romantic escape. With its breathtaking natural sceneries, Bali has always been the perfect place for a romantic getaway. From its beaches to its rice terraces, and waterfalls and temples, it is the ideal destination for some relaxation and romance. You can read about my things to do in Bali guide here. Antigua and Barbuda will always be on my list as it was where my other half proposed. With 365 beaches to relax on, amazing food, amazing people, serenity, and beauty everywhere, it is definitely my favourite of the Caribbean islands that I have visited so far. Paris is one of the most romantic cities to visit from taking a walk together down its cute cobbled streets, seeing the glitz on Champs-Élysées, indulging in sweet decadent pastries and freshly baked baguettes, gorgeous landmarks such as the Eiffel Tower to take selfies at and all the wine and cheese. A yearly trip to Paris is always on our agenda and if you are looking for a short haul romantic break, it is a winner. Kenya is such a romantic place where you can enjoy an adrenalin rushed exhilarating safari and then relax on its Indian Ocean beaches – the perfect mix of adventure and relaxation. If you are looking for a romantic break which has a slice of everything, Kenya ticks all the right boxes. Italy is full of romance, and my favourite place is Tuscany with its rolling green hills, all the pasta and pizza and wine you could dream of, lush vineyards, creamy gelato and truffle! Whenever we think of choosing a romantic escape, Tuscany pops up as a nostalgic memory and I know we will be back! Devon is our favourite place in the UK for a romantic weekend or long weekend break. The English countryside has got such stunning views and it is so peaceful. The highlight is the Devonshire Cream Tea to enjoy together as well as lovely walks through scenic fields. There are lots of lovely National Trust buildings to visit too. There is something so charming about Cuba that oozes with a different kind of romantic appeal. Its rustic feel, its lack of modernity, its lack of chain restaurants and its vintage cars make for a unique holiday and my advice is to visit sooner rather than later before it all starts changing. Havana is perfect combined with Varadero and the beaches in Cuba are absolutely postcard perfect. You can read my highlights of Cuba here. St Lucia has lush landscapes all over its tear-dropped shape. All along the coastline there are just so many breathtaking views and stunning scenery, making this Caribbean getaway alluring and romantic. I loved the pitons, as well as the fact that the island was renowned for its chocolate, with the Hotel Chocolate hotel and restaurant on the island, a great place to go for a chocolate making experience or to have lunch with a view. You’ve pretty much named all my favourite places, though I’m still yet to visit Cuba. All the most beautiful of place! So many beautiful places, only been to 5 of those, need to get some more ticked off my list! Great information about the most romantic destination, I love to read it and your pictures are really great. Thanks for posting this detail here. I’m surprised Positano on the Amalfi Coast isn’t in there. If you haven’t visited you must! I’ve blogged about it on my page. Santorni is on my bucket list! Really liked your post.